Experience a challenging and artistic runner like no other! Rich in content and challenge. How does it feel to capture lightning in a bottle? How would it look to illuminate your home with a rainbow? How does one properly describe Rolling Sky? The answers can never truly be put into words, but with the last item on that list, we can at least try. Rolling Sky can only be called an experience that's small enough to fit into your pocket, yet large enough to keep you enthralled for hours on end. The goal of Rolling Sky is as simple as it gets: just guide your sphere to the end and you win. However, you'll quickly learn that getting there is easier said than done. Explore over a dozen distinct and beautiful worlds. 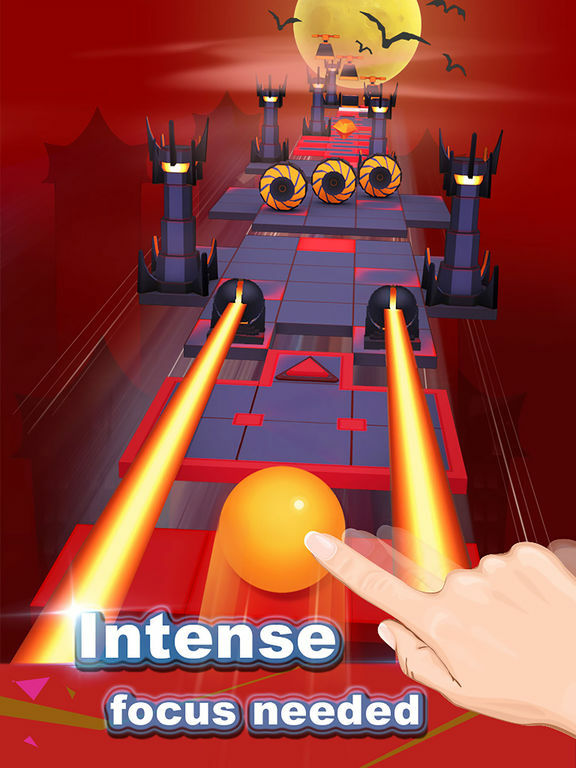 Dodge hundreds of hazards, including bottomless pits, hammers, rapidly growing trees, laser beams and more. Collect jewels as you go. Mobile games don't normally lend themselves to artistic merit, but Rolling Sky just might change your mind. Challenging gameplay awaits those curious enough to seek it out, but so do many gorgeous surreal worlds on top of a soothing soundtrack. 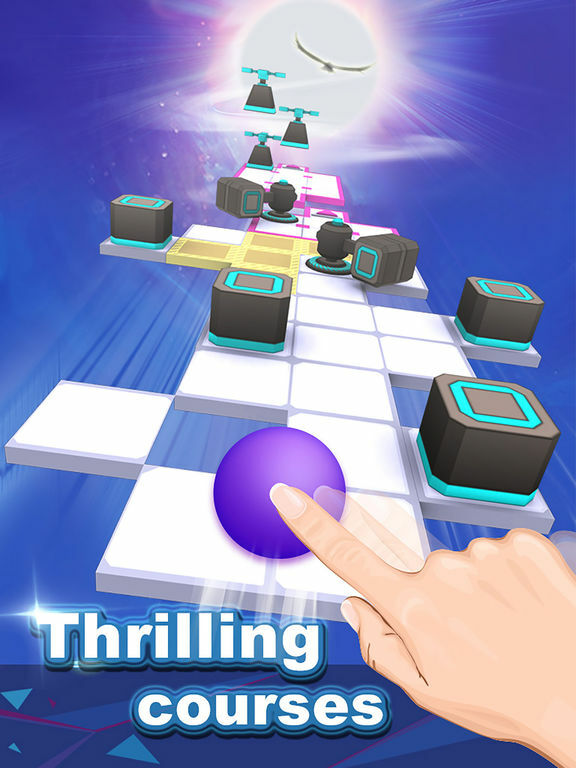 If you're up for something completely unexpected, then download this game now! 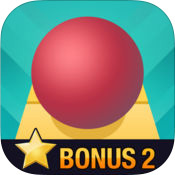 If you were told that a game about rolling a ball down an obstacle course would be one of the most gorgeous and engaging apps you could fit onto your phone, you'd probably laugh. Admittedly, that may not be the most flattering description, but when you apply it to Rolling Sky, it's the truth! By combining simple gameplay with sophisticated visuals backed by strong artistic design, Cheetah Games have created something very special. If Rolling Sky were to be classified as anything, the endless runner would be the safest bet. It abides to the basic conventions of the genre; your avatar, represented as a simple sphere, automatically rolls forward, and with a few simple swipes, you weave your way back and forth past the many hazards obstructing your path. However, it eschews a lot of the tropes that go hand in hand with the genre as well. For one thing, it's not really endless; every level has a set beginning, middle and end, with none of the usual randomization to be found. There's also no free jumping; you can only move left and right. Finally, there are no power-ups to grab, and there's no store from which you can purchase upgrades. It may sound simplistic when compared to something like Temple Run, but there is indeed a simplistic beauty to Rolling Sky's gameplay. This is a game of pure skill. You need good reflexes, hand-eye coordination and memory to succeed. There's a great amount of trial-and-error involved, as crashing results in having to restart the level you're playing from the beginning, but as long as you learn from your mistakes, every failure is really just another step closer to victory. When you reach the end of a level, it really feels like an accomplishment. You may not be able to jump, sprint, fly, shoot fireballs or enjoy invincibility, but play Rolling Sky for a few minutes, and you won't notice. It helps that Rolling Sky is a very good-looking game. Virtual environments are crafted from 3D visuals that, while simple in structure and design, are assembled in such an aesthetically-pleasing way. Most things you see are distinctly cubic and blocky-looking, appearing as though they're made from some knockoff Lego product. The ground is made up of panels that often shift and slide around, flashy beams of light are fired directly into the camera, brightly-colored hammers rhythmically pound the ground, and objects pop up as if there was some kind of clockwork mechanism at work in the background. It's hard to pin down how to describe Rolling Sky's look, which is really quite surreal, but one could say that it's very toy-like in a way. The game features 10 worlds and even more bonus levels, each of which is given a distinct theme. One world gives the impression that you're in a forest; there's a green background filled with trees, you roll on green tiles, and trees are the most common obstacles you have to evade. Another level is given a very Hellish appearance, with its ominous black-and-red mountainous background, dark color scheme, abundance of fiery hazards, and the many foreboding obelisks dotting your path that all resemble the tower of Barad-dur as it was depicted in the 'Lord of the Rings' films. Rounding off the app's superb production values is a top-notch soundtrack. Every song is pleasing to the ear, positively catchy, and tailor-made to fit the level it was composed for. The first level features a calm and tranquil tune that would be quite soothing if it was heard in isolation, while the aforementioned Hellscape level has a very head-banging, quasi-metallic song to go with it. The artistic visuals and sometimes soothing music can make Rolling Sky seem like a relaxing experience at a glance, but it can actually be pretty harrowing. You have a lot of obstacles to contend with, from laser beams and trees to dodge past, hammers to avoid, and sliding floors to stay balanced on. There are also chasms that can only be traversed by hitting springboard panels that propel you into the air, and you'll often have to make several such jumps in rapid succession. Sometimes, you have to roll over a switch to move the floor in the right direction, and missing it will spell certain doom. One nice thing about the game is that you don't have to complete each level in sequential order. If you want to skip straight to World IX at the beginning, you can, and this can definitely be good if you need a change of scenery or the earlier levels are proving too easy for you. More than likely, that won't be the case. Even the first stage can be pretty hard, and the difficulty only gets more vertical from there. If you get easily frustrated, it will only be a matter of time before you fling your phone into the wall after you crash into that same bumper for the zillionth time in a row. Fortunately, there are alternative ways to test your skills. Each level contains a number of gems to collect, so if it feels like you've mastered a specific world, then you can try repeating it with the intention of getting all the gems. It's not the be-all solution to everything, but it's a decent alternative way to play the game if it gets too hairy for you. Conclusion: The Sky is on a Roll! Overall, while Rolling Sky is pretty tough, there's no doubt that it's one of the most unbelievably polished mobile games ever made. There's a simplistic beauty in both its looks and mechanics that can't be denied. If you're up for a challenge, it deserves a place in your library. Get it!